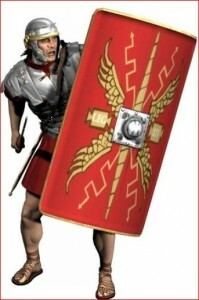 God’s favor in the lives of His children is said to be like a shield also. The Psalmist writes in Psalm 5:12, “For You, O LORD, will bless the righteous; with favor you will surround him as with a shield.” Everywhere you turn there you will find God’s favor. It surrounds you! Instead of being surrounded by those who have ill intentions towards you, you are surrounded by the “favor” of a God who loves you and has your best interest foremost in mind regardless of the circumstances you may be facing. Nothing can get through to you, without God’s permission and whatever He allows to reach us will always work out in our favor! Another aspect of the shield is associated with the belt of truth which was the first item Paul mentioned of the armor of God. His protection is like that of a hen over her chicks. Psalm 91, verse 4, tells us, “He shall cover you with His feathers, and under His wings you shall take refuge; His truth shall be your shield and buckler (belt).” The mother hen will sacrifice her life for the safety of her chicks. God gives his life for our well-being. As a hen deals with her chicks, so does God deal with His children. In 2 Samuel we see this picture again of the shield referring to our salvation. Verse 36 says, “You have also given me the shield of your salvation; Your gentleness has made me great.” God is gentle with His children even in the midst of great strife. These words of David in 2 Samuel are repeated in one of his famous songs (see Psalm 18:35).